The curriculum of the bachelor degree in Architecture emphases on the development of design skill and entrepreneurship of the graduates. Creativity in spatial utilization, sensitive to site and people and strong individual characteristics are the qualities tries to be achieved by our curriculum and academic atmosphere. It takes 4 years comprising in total 152 credit of sks (credit system in Indonesia). The courses are clustered in four teaching groups namely: History, Theory and Criticism (HTC), Building Science & Technology (BCT), Urban, Housing & Landscape (UHL) and supported by Institutional Character teaching group. All architectural groups of tutors (HTC, BCT, UHL) are integrated in developing design studios conducting the Integrated Design Skill (IDS) courses. Pendidikan Profesi Arsitek (PPAR) or Professional Program of Architect offers a 1 year professional program leading to “Arsitek” ready for licensure by the Indonesian Institute of Architect (Ikatan Arsitek Indonesia – IAI) as the program has been endorsed by them. The curriculum develops students a strong ability in handling both for public and private clients in professional level of services. The “Professional Studio” utilizes real and mirror projects conducted by our strategic partners or by the Lembaga Bantuan Arsitektur (LBA). The tutors of the program come not only from internal staffs of the Department but also from the Indonesian Institute of Architect (IAI). The curriculum complies to the IAI requirement. The Department also refers its curriculum to the “13 Professional Competence” of the Indonesian Institute of Architects or Ikatan Arsitek Indonesia (IAI). Those competences are described as follows. 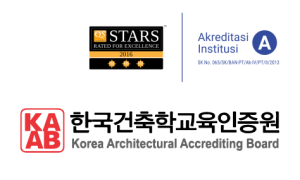 The Department of Architecture UII, in its attempt to pursue “Substantial Equivalency” in international circle refers to the 37 points of Korea Architectural Accrediting Board’s Student Performance Criteria (SPC). The detail of the SPC is listed as follows.